When I was in graduate school at NYU, I occasionally spent time wandering the stacks of Bobst Library. With only a subject matter and a range of Dewey Decimal numbers in mind, I’d take to the shelves intuitively–looking for interesting book titles to crack open. One afternoon, while scanning a long and deserted isle of poetry under the indifferent hum of the library’s fluorescent lights I found a book of verse whose title offered the possibility that its contents may have some connection to musical or sonic things. 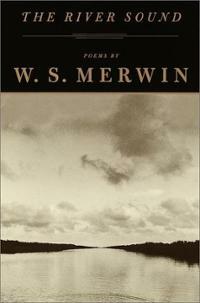 The book was The River Sound and its author was W. S. Merwin. “Everything happens once. You’re born once. You learn to talk once. You fall in love once. You make every mistake once. It’s a different mistake the second time even if it seems to be the same one. Your mistakes are very important and you should pay very close attention to them. One of the things that I can tell you….is that you’re very interested in getting from here to there. You’re very interested in finding the answer to the question. You forget about the question in looking for the answer. But the question is really much more interesting than the answer. One you get to the answer you think you’re there, but you’re never there …The fascination with the answer should not ever obliterate the deep respect—endless respect—for the question itself. The question is the thing that goes on opening out, teaching you things. Your knowledge is wonderful…But in the long run it’s a delusion. It makes you feel like you really know it. The other thing your ignorance may lead you to is a sense that you are a great paradox. That you are only yourself and that you are connected to everything else at the same time…I believe that respect for your ignorance may lead to you to a sense that everything is connected. The thing that makes us distinct…is something that on the one side is compassion, and on the other side imagination. Compassion and imagination are part of one another. Whatever you’re doing, what you want to be watching for is to be doing what only you can be doing. If you’re not doing what only you can be doing—and your ignorance is terribly important in this—you’re going to feel miserable. Your ignorance is a great gift to you. It’s the link with your imaginations, with your compassion–with all the things that really matter. It’s the thing that you may hear in Mozart and Mozart may be telling you, and that you may be able to see in Vermeer and that girl pouring a pitcher of milk. The most startling image in painting to me is that milk pouring out of the pitcher. Why is that so? I don’t know. Reblogged this on These Anointed Ruins.